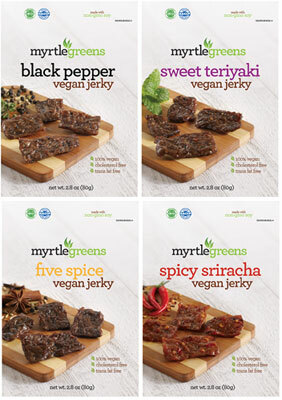 Inspired by the flavors of the world, Myrtle Greens Vegan Jerky gives you the perfect flavor and chew in every piece with all-natural ingredients that are non-GMO! Black Pepper - Native to Southern Asia, pepper has enriched the flavors of food for over four thousand years. Now the world’s most traded spice, it brings a delectable bold taste and smoky flavor to this Black Pepper Vegan Jerky, creating a succulent snack ready to satisfy. 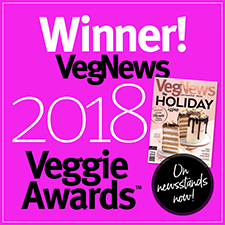 Sweet Teriyaki - Marinated in a sweet and savory sauce that has thrived in history for more than four hundred years, this Sweet Teriyaki Vegan Jerky is reminiscent of well-known dishes from Japan. Spicy Sriracha - Thanks to its rich flavor, sriracha’s popularity has steadily increased ever since its inception in Thailand. This Spicy Sriracha Vegan Jerky features a sharp kick to keep you moving and burst of warm heat to bask in. This is one snack you won’t soon forget. Five Spice - The essential ingredient in many Chinese dishes is a blend of five carefully selected spices to create the perfect balance of savory and sweet. Made with quality herbs for a flavor faithful to its origin, this Five Spice Vegan Jerky brings you a taste of traditional Southern China cuisine. All varieties are available in 2.8 oz. 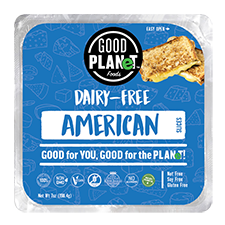 (80g) packages for $6.49 each. From Jill of Port Washington, New York on 10/18/2018 . I Love this Jerky! I've tried a lot of vegan jerky and Myrtle Greens Five Spice flavor is amazing! Tastes fresh and tender, even better in the microwave for 10 seconds. Chewy and very satisfying.